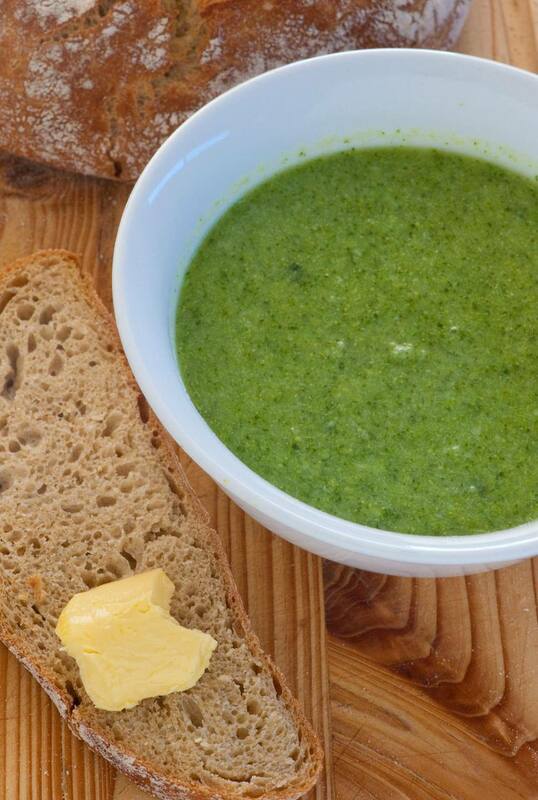 Don't let the "low-fat" label of this good-for-you broccoli soup recipe turn you off. It's just as creamy as higher-fat versions and satisfying any time of year on its own for lunch or as a starter to a complete meal. The trick to adding body to low-fat soups is by using potato and some low-fat or nonfat milk and then whizzing it in a blender. Heat oil on medium heat in a soup pot or Dutch oven. Gently sauté onion and celery for 3 to 4 minutes, until onion is softened. Add potato and chopped broccoli, followed by the broth and milk. Bring to a boil, then reduce heat, cover, and simmer for 20 minutes, or until vegetables are tender. Allow soup to cool slightly, then transfer to a blender in 2 to 3 batches, and blend until smooth. Return soup to pot and heat gently until ready to serve. Even if you plan to serve this soup as a stand-alone dish, every creamy dish needs a little crunchy flavor contrast. But don't sabotage the low-fat theme by serving traditional bread rolls to dip into the soup or croutons sprinkled on top. Instead, choose healthy, low-carb, low-fat sides. You can try sprinkling your serving of soup with a few tablespoons of grated low-fat cheese or 1 ounce of healthy-fat seeds like poppy, pumpkin, sunflower, or flaxseeds. The seeds can be raw, roasted or dried and will deliver a healthy dose of fiber and protein along with the healthy fats everyone needs. A side dish of crudités like carrots, celery, jicama, bell pepper slices also will deliver much-needed crunch. If you're looking for something more substantial to go with your low-fat soup and want to keep the green theme going, this springtime spring roll would be perfect. It's made with fresh asparagus, snap peas, radishes, and green garlic, as well as sprouts and tender lettuces. Include slices of baked tofu, shredded roast chicken, or poached shrimp for added protein, but the spring rolls are just as delicious in their all-veggie state.